This time, Villanova is going into the NCAAs with a conference tournament title and probably the No. 1 overall seed. The second-ranked Wildcats will find out Sunday when and where their national championship defense will begin. On Saturday, they showed that when they play Villanova basketball, they are very tough to beat. Josh Hart scored 29 points to lead Villanova to a 74-60 victory over Creighton in the Big East championship game. "We wanted to set the tone," the senior guard said, wearing a net around his neck. "We wanted to play 40 minutes of Villanova basketball." Good defense, sharing the ball and making 3-pointers is the formula that has led top-seeded Villanova (31-3) to four consecutive Big East regular-season titles. "We might have played our best defensive game of the year," coach Jay Wright said. Hart, the conference player of the year, became just the third player to win the tournament MVP award twice, joining Patrick Ewing of Georgetown and Peyton Siva of Louisville. "Just being a winner," Hart said when asked how he wanted to be remembered in the Big East. "That's all I care about. No accolades for me. I don't care about that. I care about my brothers and winning." Hart and fellow seniors Kris Jenkins and Darryl Reynolds have posted a record of 128-16 in their four seasons. "I'd be remiss if I didn't mention how well that Kris and Josh and Darryl, what great ambassadors they've been for the Big East Conference," Creighton coach Greg McDermott said. "The Villanova program in general, for a basketball purist like myself, the way they won it last year, team basketball, and just the way they carry themselves. "It starts at the top with Jay, obviously. But that senior class, what they've accomplished is incredible." This was Villanova's third Big East Tournament crown, the others coming in 1995 and 2015. When asked if Villanova would get the No. 1 overall seed in the NCAA Tournament, Wright responded: "Probably. But we don't really care. ... We're going to be fine. We're going to be fine. Wherever they put us, whatever our seed is." The Wildcats had their hands on so many Creighton passes, they forced a season-high 17 turnovers that led to 21 points. And with Hart leading the way, they made every big shot they needed. Jalen Brunson added 17 points for Villanova. Jenkins, whose 3-pointer won the national championship game last year, had 14. Cole Huff and Marcus Foster each scored 13 points to lead sixth-seeded Creighton (25-9). Villanova, which lost last season's Big East championship game to Seton Hall, closed the first half on a 25-11 run to go up 36-22. Hart had 12 points in the spurt and Brunson added eight. The two combined to score the Wildcats' final 20 points in the semifinals. The lead reached 46-26, and the closest the Bluejays got the rest of the way was 12 points. Hart, who along with Brunson defended Foster, scored every way imaginable, from 3-pointers to acrobatic drives. Hart finished the tournament with 63 points and was 21 of 41 from the field. The 29 points marked his third-highest total of the season. In the semifinals it was Hart's three-point play with 9.6 seconds left that beat Seton Hall. "He's a great player. He always makes the right play either scoring, passing the ball or rebounding," teammate Eric Paschall said. "Whatever we have to do to win, he's willing to do, so that's what makes him so great." "That's why this team is as good as it is and we're getting better," he said. "When your best player is the one getting better and he's the one who's leading out there, he makes everybody else follow suit." Creighton was 2 of 12 from 3-point range in the first half and the Bluejays committed 10 turnovers, only 2.3 fewer than they averaged per game this season. The title game was played before a sellout crowd of 19,812 at Madison Square Garden, which hosted the tournament for the 35th consecutive year. Creighton: The Bluejays' only other championship game appearance was in 2014 when they lost to Providence. ... Creighton lost three of four games coming into the tournament. ... The Bluejays beat Providence 70-53 in the quarterfinals and Xavier 76-72 in the semifinals. ... The 14-point halftime deficit was Creighton's largest of the season, and its 22 points were five fewer than its previous low for the season. 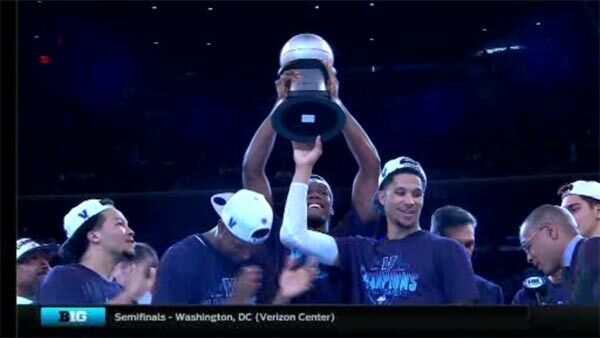 Villanova: The Wildcats swept the season series with Creighton, winning by 10 and 16 points. ... Villanova beat St. John's 108-67 in the quarterfinals and Seton Hall 55-53 in the semifinals. ... The Wildcats came into the game 2-2 in Big East championship games. The game's first free throw was taken with 4:30 left in the first half. Jenkins, Brunson, Foster, Angel Delgado of Seton Hall and Trevon Bluiett of Xavier comprised the all-tournament team. Villanova finished 9 of 26 from 3-point range, with Hart going 4 of 8. Creighton was just 6 for 24 from beyond the arc. Creighton: Will wait to hear where it is headed in the NCAA Tournament on Selection Sunday. Villanova: Should hear its name called first when the brackets are announced.